Exercise is a vital partner in both Breast Cancer prevention, in recovery, and the little spoken about prevention of metastases. We all know to exercise for heart health. Yes, heart disease kills more women every year than breast cancer. 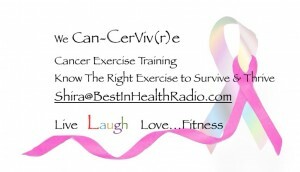 Even if we are BRCA or PALB2 positive, the right exercise can help in the prevention. Most women who develop breast cancer do NOT carry the BRCA gene mutation, and many women who do carry the mutation do not develop breast cancer. Lifestyle choices are huge in the prevention of breast cancer. However, this does go far beyond exercise. Often, people are exposed to mutagens, unknowingly, oxidative stressors and endocrine disruptors, all of which can feed cancer. Therefore, getting informed, can help dramatically in prevention. and women….alcohol is NOT your friend, at all. Physical Inactivity: The saddest part here is – most people do not know what this means. Its not about going to the gym X number of times per week. Its not about becoming a competitive athlete, and it is far more than going for walks – however a good start. Physical activity for chronic disease prevention/management requires cardiorespiratory, building muscle mass at all ages avoiding sarcopenia, cachexia, stretching & flexibility……The misconceptions here are terrifying – its not about hiring a personal trainer, and your physical activity should not be dependent on going to the gym. Physical activity is just as critical for emotional, psychological & cognitive health as it is for physical health. Let us find the exercise & physical activity that meets your personal needs. Remember: physical activity, exercise, training. Obesity: Obesity is a chronic illness unto itself. Even if you insist you can’t lose the weight, it is no less deadly. Our body is not happy to be at that weight. Long term sustainable fat loss is a science. It is far more than calories in, calories out and throw in some exercise. It is NOT just about will power. Obesity is the major contributing factor to certain cancers, heart disease, diabetes….just about every disease, contributes to emotional health issues, and obesity induced cirrhosis of the liver, which can lead to liver cancer has over taken alcohol cirrhosis of the liver & is growing exponentially. Poor Eating Habits: Notice how I listed this separately to obesity. Ever heard of skinny fat syndrome? Just because a person appears to be at a healthy body weight, does not mean they are eating a healthy diet, it does not mean they have a healthy body composition. Our diet – is our very best defense against chronic illness along with physical activity. We are what we eat, digest & absorb. Healthy living is very vital to our life. This includes exercise and healthy eating habits as you mentioned in your blog. This article is very helpful.